It’s quinoa burger time!! 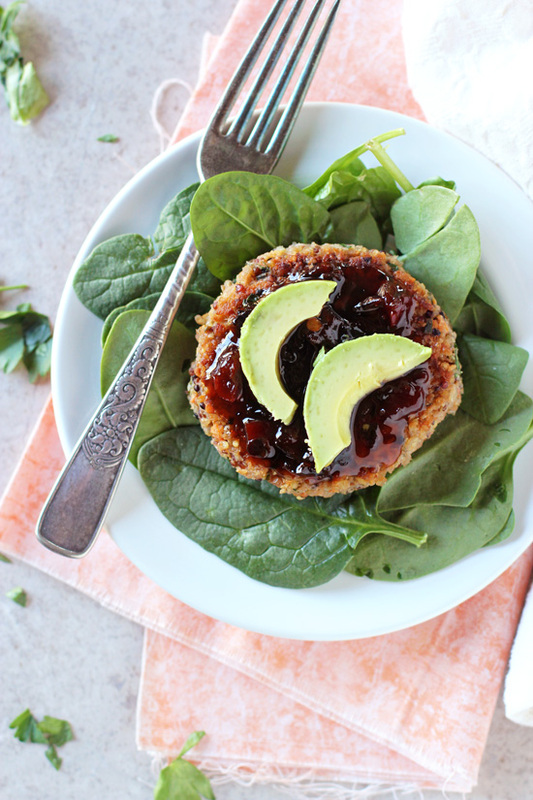 Crispy, healthy, and perfectly flavorful quinoa burger time! But, but, but. Before we get to today’s burgers let’s have a little chat. I know things have been a bit sporadic lately and I just wanted to say thank you for bearing with me. To make a long story very very short (and um, not super complain-y), we were just about to wrap everything up with our never-ending house reno … anddd then a new problem was discovered. I’m tired, stressed and beyond frustrated … and still dealing with a stream of contractors who have to come in and out of the house to cut the power just one more time. Ompf. <— We’re keeping things real here today! At some point everything will get back to normal, but for now, well. It’s still a bit nut-o. To the max. So! 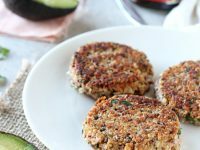 Now that we have that out of the way, let’s get to these fresh herb & roasted garlic quinoa burgers! Here’s how they go down. We have some soft and buttery roasted garlic. We have some quinoa. Some basic veggies, some walnuts and a whole boatload of fresh herbs! Parsley, chives and dill, oh my! It all gets mixed together with a few other pantry staples, formed into patties and then cooked up to crispy perfection in a skillet. They’re packed with flavor, not at ALL dry, and decently sturdy. That’s a triple threat right there when it comes to veggie burgers! Yes indeed. First up! Please don’t be scared away by the total recipe time! It includes 50 minutes for the garlic to roast in the oven – which is completely hands off! AND you can even do this in advance! Leaving you at right around an hour for the rest of the recipe. Want to cut down on the recipe time even more? Cook the quinoa in advance as well! These little burgers freeze beautifully. So you can also make them entirely ahead of time. I like to let them thaw out overnight in the fridge and then reheat briefly when ready to enjoy. Let’s talk how to serve. I stupidly forgot to buy burger buns when I went to photograph these (or really, english muffins since they are my favorite right now for burgers!). So, ummm, they’re totally not pictured. But! They are delicious that way as a classic burger with carb-y goodness, or over lettuce or greens, or even over roasted veggies! I’d also highly encourage you to try topping with a smear of pepper jelly and some sliced avocado. <— SO GOOD!! Ooo, ooo and when served with a side of sweet potato fries??? Goodness me, I’m in burger heaven. 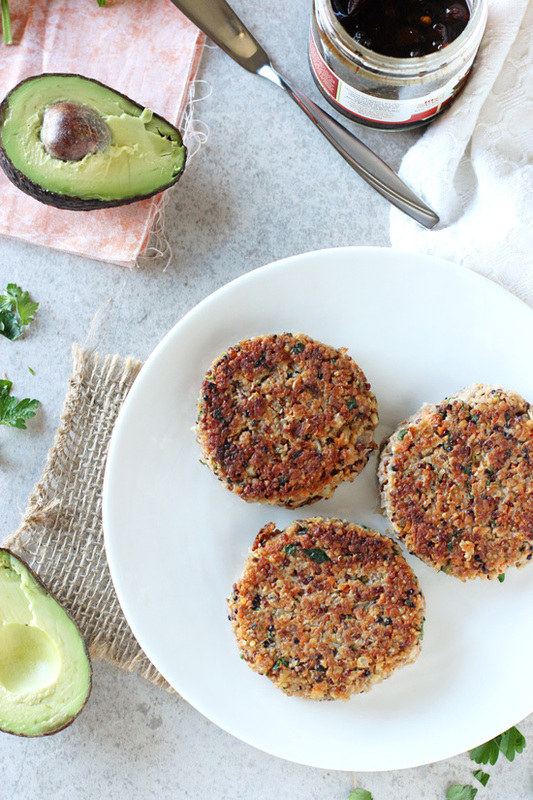 Crispy on the outside & soft on the inside, these fresh herb & roasted garlic quinoa burgers make for a fantastic meal! Packed with so much flavor! Cut off the top end of the head of garlic, so that the bulb remains intact and the cloves are exposed. Remove any of the outer loose layers of the garlic bulb, then place on a piece of aluminum foil. Drizzle with olive oil and then sprinkle with a little salt and pepper. Wrap the garlic in the foil. Bake for about 45 to 50 minutes, until the cloves are golden brown. Once cool enough to handle, squeeze the cloves out of the peel. Use a fork to mash the cloves into a paste. Measure out 1 tablespoon (you can save any extra for another recipe!) and set aside. Add the quinoa and vegetable broth to a small saucepan. Bring the mixture to a boil, then cover, reduce the heat and let simmer for about 15 minutes, until the liquid is absorbed. Turn off the heat and let the pan sit covered for 5 minutes, then fluff the quinoa with a fork. Transfer the quinoa to a large bowl. Add in the onion and carrot, then set aside. Add the walnuts to the bowl of a food processor. Process until finely ground, but don’t go so far that it turns into a paste. Add to the bowl with the quinoa. Add the beans to the bowl of the food processor. Process until about half of the beans are pureed, but the rest still have some texture. Add to the large bowl, along with the parsley, chives, dill, breadcrumbs, flour, salt and the 1 tablespoon roasted garlic. Mix until well combined. Taste and season with additional salt, if needed. Add the egg and tomato paste to a small bowl and beat together with a fork. Add to the large bowl and mix again until well combined (if the mixture is too wet to form into patties, add additional flour, 1 tablespoon at a time. Don’t add too much, or you’ll dry out the burgers!). Set a large nonstick skillet over medium heat. Pour in a good glug of olive oil. When hot (once the oil is hot, you want there to be enough so that it pretty much covers the bottom of the skillet in a very thin layer), add in as many patties as will comfortably fit. Cook for about 4 minutes per side, until browned and crispy. Remove to a paper towel lined plate. Repeat this process for all the patties. Serve however you would like! I like to mince the onion and carrot in my food processor. Makes it nice and fast. If you roast the garlic ahead of time, it will cut down significantly on the time for the recipe (by about 50 minutes)! Just mash into the paste and then store in an airtight container in the fridge until ready to use! I am new to your site but I was looking for a roasted garlic & quinoa burger recipe and stumbled here. Thank you for sharing. I am vegan and I noticed that one of the ingredient is egg; I’m thinking to have everything stay together nicely. 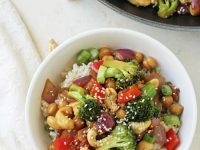 Is this optional or is there an alternative to make this a vegan dish? Hey Shantel! So glad you’re here 🙂 Yes – the egg is there just to help bind it all together. I think you could definitely try using a flax egg in its place. Or, you may even be able to get away without using it at all (and use a tablespoon or two of water in its place) – I’m not totally sure though since I haven’t tested it that way myself! Please let me know how it goes! You are doing better then me Ashley, everything is so topsy-turvy right now for me and the blog has taken a bit of a back burner at the moment. You are still posting lots of beautiful recipes and these burgers look amazing! 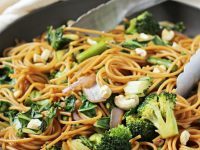 I’ve been trying to find creative ways to get my kids to eat healthy alternatives to fast food burgers. This one was a hit! Thank you! So happy to hear it Tony! Oh no! I’m sorry to hear you’ve been having trouble with your renovation. I can only begin to imagine how stressful that is. Hang in there girly! Seriously – roasted garlic is the best! Thanks Sarah! Hang in there. Soon your house will be totally yours without strangers traipsing through! These quinoa burgers looks so delicious. 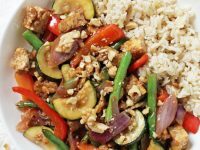 Healthy and full of flavor is the best combination! I’m always on the hunt for great veggie burger recipes and this one looks AMAZING! Definitely going to add to my list to try! Ahh lady, I hope that your house stuff gets wrapped up soon! That stuff can be so time consuming and stressful. These burgers look delicious! I love making homemade burgers. Bookmarking the recipe to make sometime soon! Ohhhh girl, I’m so sorry to hear the home renovation has been problematic! That kind of stuff is definitely so stressful…keeping my fingers crossed everything gets worked out soon! I’m loving these beautiful burgers! So clean, healthy, and satisfying! Definitely soul food to ease the tension! Have a great weekend, lady! Oh my gosh, I’m so sorry to hear you’re still having house Reno problems!! My parents are renovating too and they were supposed to finish in November…well, it’s May… 🙁 and finishing touches are *still* being done. I hope it all wraps up SOON for you!! These burgers on the other hand have no problems. I am obsessed with roasted garlic so you had me from there!! 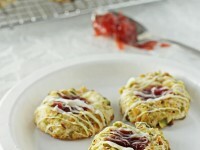 I LOVE that you served these with pepper jelly – ingenious!! Oh my gosh that sounds exactly like how our timeline with the reno has gone! lol Tell your parents I feel their pain!!! haha And thank you!! I’m so sorry you have to deal with all that stuff — it’s such a pain! I hope it all gets worked out soon, and I’m glad you got to post these awesome burgers! We made quinoa cakes in cooking school and I loved them but never made them at home because of the boys in the house here. haha These would be great for me to freeze for myself however and I love the sound of the pepper jelly smear! Who needs buns? Yes! I love pulling them out of the freezer for a quick lunch! Thanks so much Marcie! Ooooo! These look and sound fabulous! Love the roasted garlic idea instead of chopping it. So much flavor in that roasted garlic – of course you know this. Hahaha! I love eating my hamburger with an english muffin. So much better than a bun. 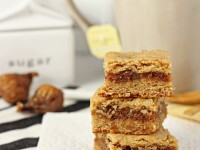 Thanks for this recipe Ashley. Roasted garlic is truly magical!! haha And I love that you use english muffins too – they are so perfect for burgers! Have a great weekend! How delicious! I would love to try this. I love how well you guys eat at your house…always so healthy yet delicious. I like how you get a big batch and I’d love to stow some away in the freezer. I totally feel your pain on the reno. I feel so bad for you! I’m sending you good vibes. Hope things get resolved and all that disruption and dust will be in your rearview mirror soon! Take care! Aww sorry to hear about running into more problems! It’s always something, right? Hopefully it’ll all go smoothly from here on out. 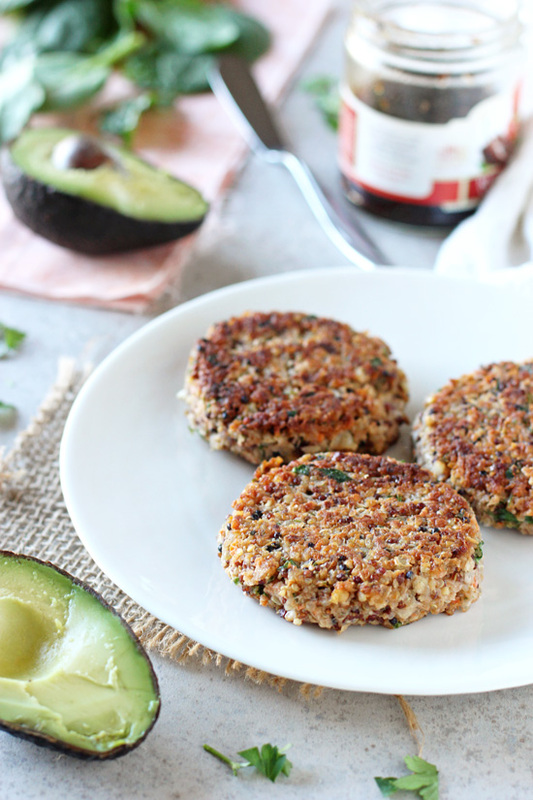 These quinoa burgers look AMAZING, Ashley! I was watching a cooking show few weeks ago and they made quinoa burgers, though I love your garlic version much more. Sounds SO good! Always!! lol Thanks so much Gayle! Hang in there girl! These things will all be worth it in the end! !